If you are nervous about starting a cubit you are not alone. We all have different reasons for our nervousness...I don't understand how...I don't know if I can...I don't want it seen by...I want it just so before anyone sees it... Lets go through it one step at a time and put all that nervousness to rest. Before we start: Please read the T.O.S. for Cubits.org. If you are using IE (Internet Explorer) you will need to install and use Firefox. The WYSIWYG feature used in building articles and pages for cubits space does not work properly in the IE browser and you will become quickly frustrated. How do you install firefox? Click here for their download and follow the instructions they give you. It is easy and it is free. I am amazed that it took Cubits to get me to make the switch because it truly is a better browser. Bookmark this page so you can find it again for easy reference as needed. You may also find it helpful to open this page in one tab and open your control panel in a second tab so you can easily switch back and forth as you work. Now lets address some of the nervous problems we are feeling. I don't understand how it works and I don't know if I can do it. Using the tools Dave has provided here is easy AND we are going to discuss the process in a step by step way so that you CAN do it. I want it just right before anyone sees it. I don't want to feel like everyone is looking over my shoulder as I work or have them laughing at me when I make mistakes during the set up process. 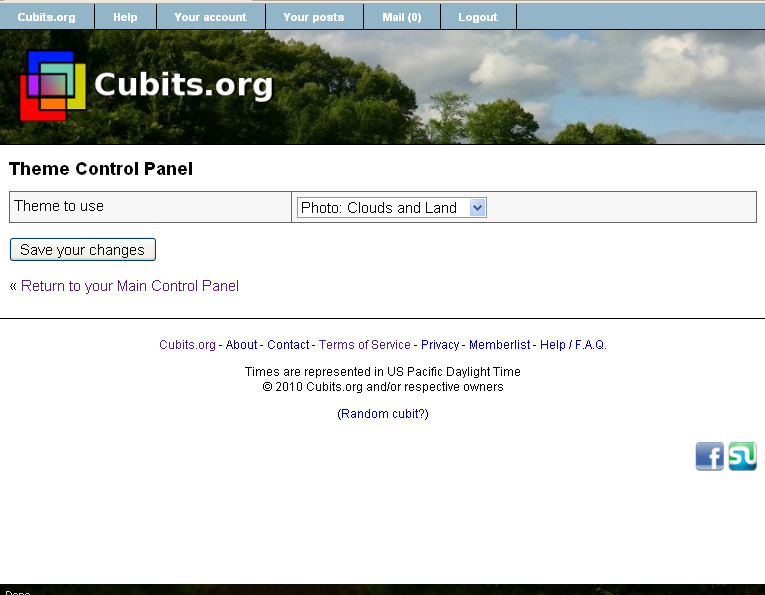 This is easy, you set the permissions to your cubit so that only the owner can see it. You can change this later to make it visible to others when you are ready. Until you make the change in permissions no one will see your cubit or even know you are working on one. It will not show up on the searches or lists. It is your secret. If you want to limit access to your cubit or just a special area of your cubit you can easily do this with a whitelist group. Once you set up a group and set the permissions to a feature, only those on the list will have access to it. Anyone not on your list will not see the feature if that is your choice. You may also decide that everone can read the posts but only your group can respond. You can change the permissions at any time. You can add or remove people from your whitelist at any time. YOU are in control. Dave has already covered the basics, HERE, so much of this will be a rehash of his instructions. 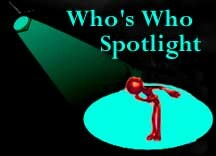 Many of you have enough web experience that you will not need further help...so feel free to get started right away. Still with me? Great! Lets get started. First, make sure you're signed in with a username, then click on "Contact" at the bottom and request a link to the "Create a Cubit" page. Once you receive that link, you can continue these instructions. Enter a name for your cubit. The name can be anything so long as it is original in reference to Cubits.org. Add a short nickname. This is optional but it is a good idea if your full name is a long one. This will keep the url (address) short and easy to use. Your nickname should contain alpha and or numeric characters only and no spaces or punctuation marks. Dave has set the system to remove illegal charaters and spaces if you forget. Click on the return to main control area link. Scroll down and select the Whitelist control. Select the option that allows access to owner. Your site can now be seen only by you. If you have other people assisting you you can set them as administrators or moderators and you can check mark here so that they may also see the cubit. Be sure to read the tips so you understand what the different group terms mean. Now I have a cubit that is only visible to me but it is empty so there isn't anything to see yet except for a forum that I can keep or delete. You can return to your cubit at any time. 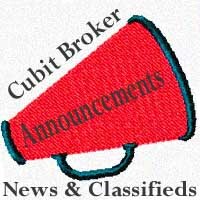 When you log in it will now be listed on your watched cubits list on the home page. 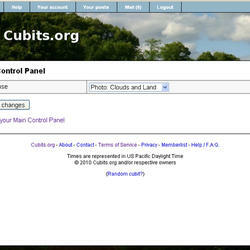 Simply click on the tool control icon in the right side bar to edit or add to your cubit. Just be sure to always save your changes before exiting. ..And this my friend is where you need to decide what direction you wish to take with your cubit. You can add content in several ways and you can use one or all of them. I suggest that you spend some time checking out some of the existing cubits to see what features they are using that you like or don't like before continuing. 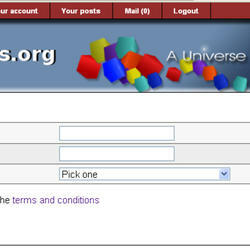 To add forums: Type in a name for your forum and click create. Set your permissions and save. You can create as many forums as you want or need. Articles can be a wonderful addition to your cubit or they can be the base upon which your cubit is focused with or without forums and other features. To begin: Go to your main control panel and scroll down to the Articles controls. Click enable. You are now ready to follow the link to the manage articles link where you will again set your permissions and save. Directly under the save button is a link to "Go to your articles page to post articles" This will open the WYSIWYG editor and you are ready to begin creating your first article. For detailed assistance in creating Articles using the provided Editor please go to my articleUsing The Editor To Create Articles And Pages. 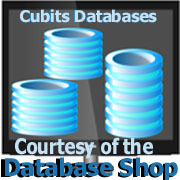 You can also add content to your cubit by using the database feature. As with the previous features you will need to enable it on your main control panel and then open the database controls. Set your permissions and structure your database. This is the most complex tool provided but it is also the most powerful and depending on the nature of your forum this feature can be the most rewarding. I have not written a detailed article on this feature but you can find assistance Here in the form of a tutorial by Dave and Here in discussion forums. Now that we have the cubits functions set up lets take a look at window dressings. Return to you main control panel and open the theme control panel. The first option listed is "theme to use" with a drop down for the available options. The default theme is shown. 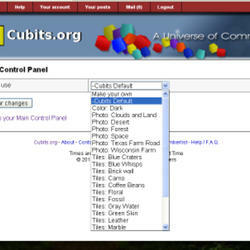 As a cubit admin, you can now control the order that all the features on your cubit's front page appear. So, for example, if you're running a new poll and you want it to be especially noticed, you can change the order so the latest voting booth appears on top. Then later change it to move down the page some. 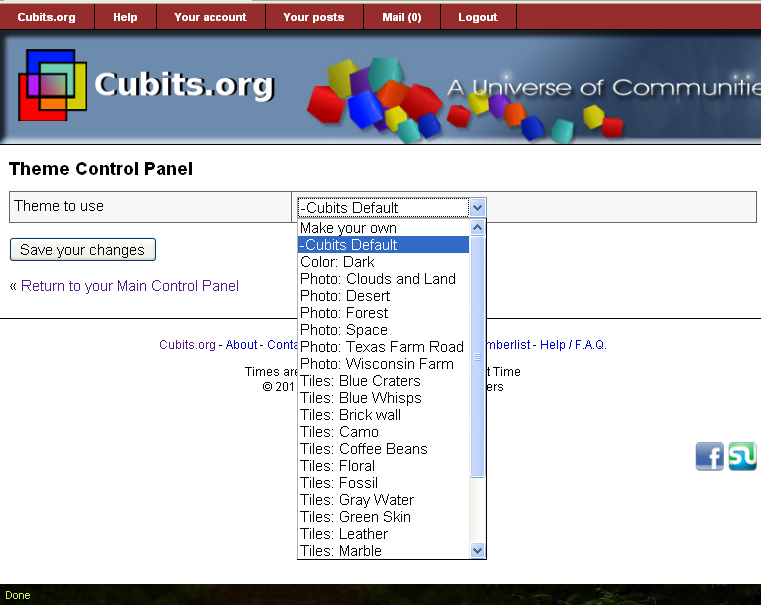 Go to your cubit's Main Control Panel, then click on "Front Page Control Panel" and from there you can drag and drop the items into the order you want them. I selected the clouds and land theme. Notice that the top banner has changed and the tabs on the navigation bar have changed to a complimentary blue color. Check out the different options. And save your choice. You may also opt to create your own. To do this you can start out by selecting create your own on the top drop down. With this option you can upload your own banner graphics and set your own color schemes. The color wheels make it simple to select a color or you can enter a color number code. Play with the colors until you get a set that satisfies you. Keep in mind that putting dark text colors on dark backgrounds or light text on light backgrounds will make the page difficult to read and the tabs hard to find. Each feature has it's own set of permissions so that you can control who gets to see a feature, who gets to add, remove or alter a feature and who can see, post or start a thread. 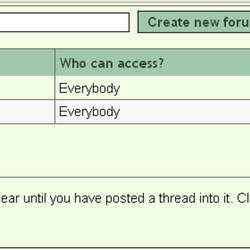 If you have multiple forums you can set the permissions for each one individually. Once you are satisfied that your cubit is ready for others to view you can go back and uncheck the whitelist and it will be visible to all.